Samsung recently updated its Experience UI to One UI when it updated its flagship smartphones to Android Pie. The first smartphone to get the One UI along with Android Pie was the Samsung Galaxy Note 9. Samsung soon updated the Galaxy S9 and the Galaxy S9+, to One UI along with Android Pie. Recently we have also seen the South Korean smartphone giant updating its 2-year old flagship product, the Galaxy S8 and the Galaxy S8+ to Android Pie. Now after updating all of its flagship products, the company is now looking at its mid-range series. The Samsung Galaxy A7 (2018) seems to be the next product on the list as the company has started the beta programme for it according to reports. Samsung is rolling out the One UI based on Android Pie to users who have enrolled themselves in the beta programme. This new update will not only update the smartphone to Android Pie but will also bring a completely different UI that should feel refreshing on the older smartphones. 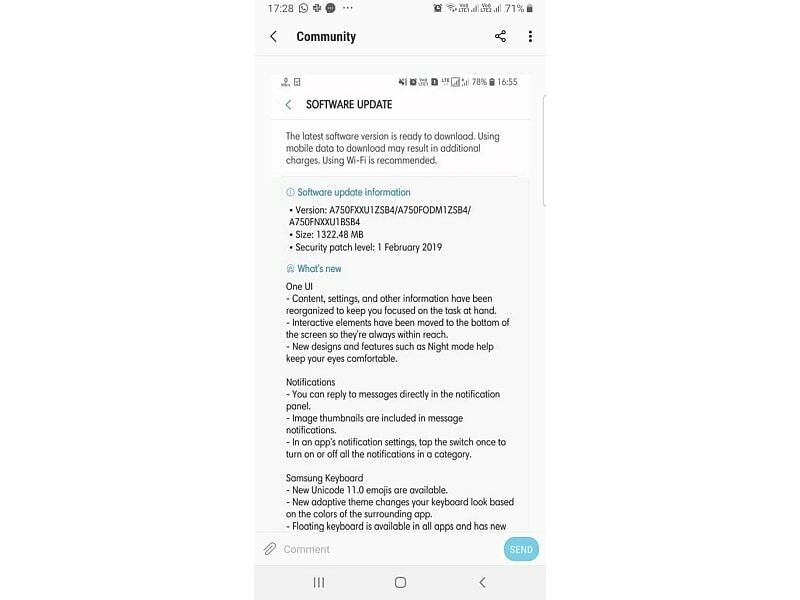 The beta build that is currently rolling out to the Galaxy A7 2018 is 1.3GB in size and the February security patch is also bundled with it. One UI focuses mainly on reachability that interactive elements in the UI have been moved down to the lower half of the screen to make them easy to reach. It also has night mode which cuts out the blue light from the display to make it comfortable on the eyes when using it at night. If you want to try the beta out, you can go the the Samsung Members app and go to Notices. If you see a banner for Android Pie beta, tap on it to register. You can then try downloading it by going to the Software Update menu.